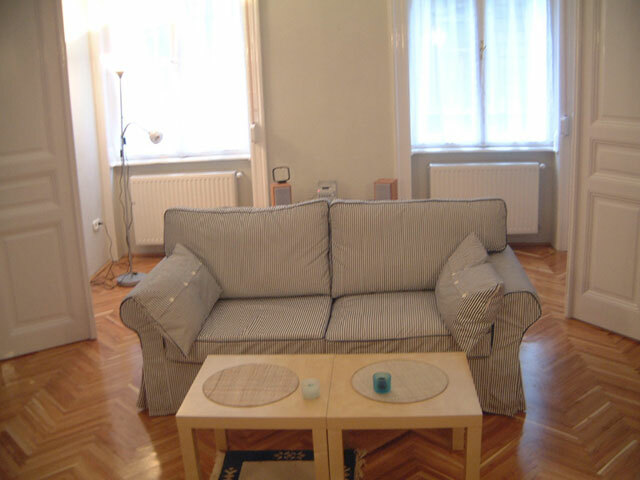 First floor spacious Budapest flat, centrally situated in Pest, very well appointed for many tourist attractions, shopping and transport links. 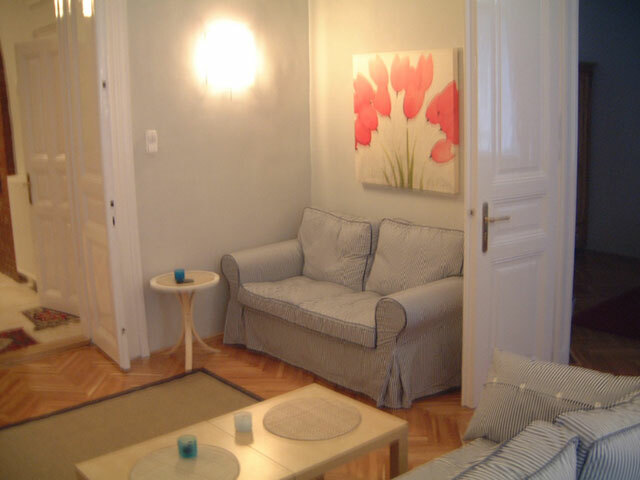 This spacious and newly renovated flat in Budapest is located in the 6th District close to the City Centre and within walking distance of many tourist attractions, including the Hot Spring Baths, Westend City Centre Shopping Mall, Parliament, the River Danube, Margit (Margaret) Island and Obudai Island (Hajogyari Sziget - home of the annual Sziget Festival). Sleeping 4 comfortably there is plenty of room to relax with 2 bedrooms, separate lounge, kitchen which is well equipped, dining areas, a bathroom and extra toilet. With internet facilities and fully programmed TV you can also just enjoy chilling out. Podmaniczky was a famous architect of Budapest, who extensively built residences for the people to occupy. He became known as the "The Bridegroom of Budapest". Podmaniczky utca 59 is adjacent to Sziv utca in the 6th district of Budapest. 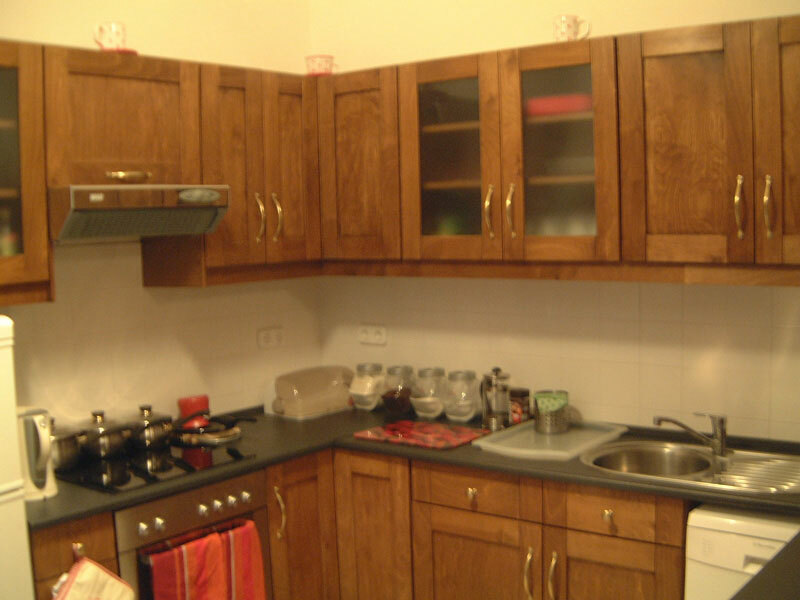 A first floor spacious flat, centrally situated in Pest, well appointed for many tourist attractions. The main bedroom has a large double bed with 2 bedside tables, 2 bedside lamps, triple wardrobe with adequate drawer space integrated, large desk table with drawers, study lamp, large wall mirror, desk chair, and further bedroom chair. 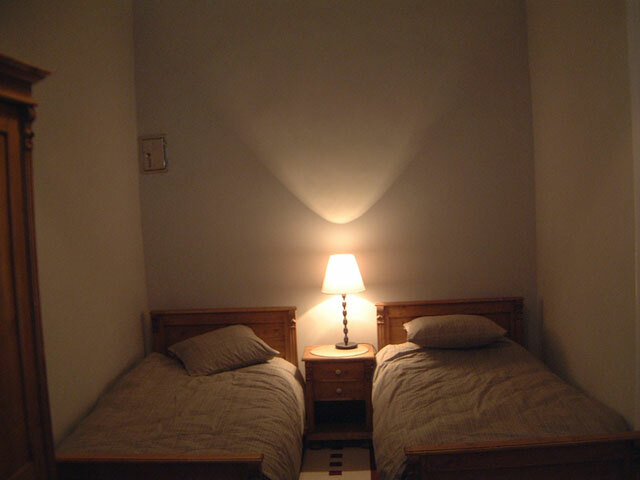 The second bedroom has 2 twin beds which can be made into a double bed, with bedside table, bedside lamp, triple wardrobe with adequate drawer space integrated, large desk table, study lamp, large wall mirror, desk chair and further bedroom chair. Lounge has large 3 seater and 2 seater settees, 3 occasional tables, large wall mirror, TV unit with DVD player (bring your own DVD's). There is a further table / book case for games etc, cushions for extra seating, and a standard lamp with reading light. The Hallway has a large shower, toilet, wash hand basin, and a 3 drawer cupboard for personal wash items. 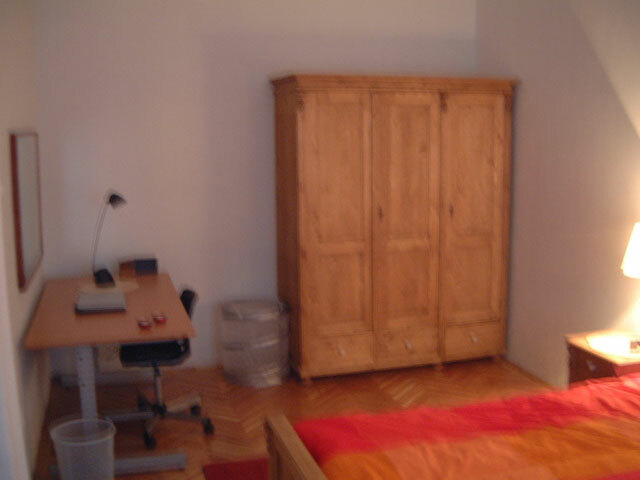 The washing machine is situated in a discreet alcove as is customary in Hungary. 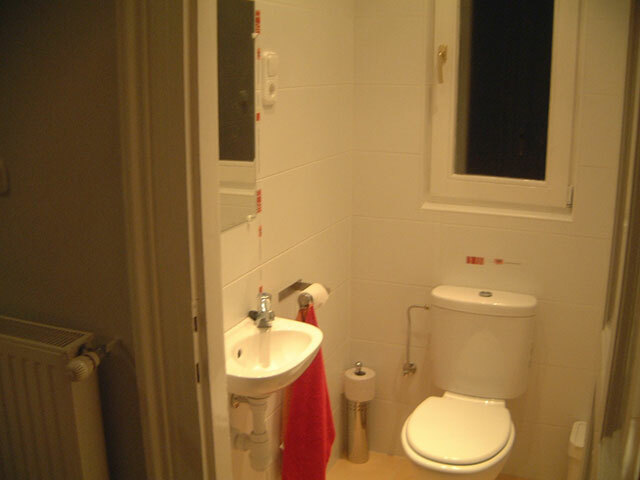 A 2nd Toilet with wash hand basin is also located from the hall. There are 2 archways from the hall. 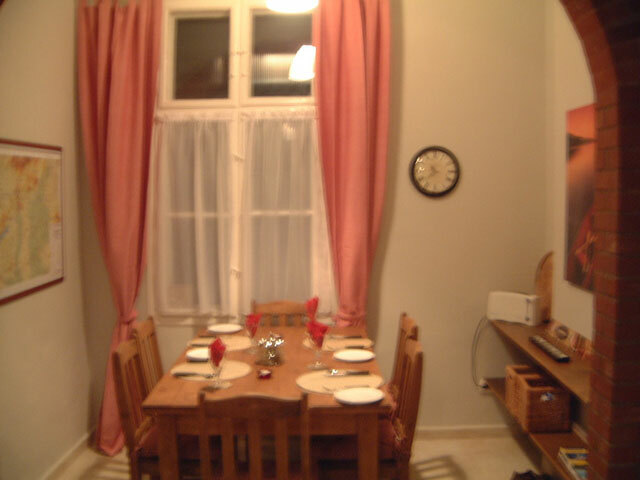 1 leads into a dining area with a large table and 6 cushioned chairs, a broad shelf for books, toaster, whatever. The other archway leads into a sizable kitchen with cooker, fridge freezer, dish washer, well stocked with cutlery, dishes, cooking utensils, containers and pots and pans. Well serviced by nearby trams, trolley buses and 2 different Metro lines. You can pick up a free map at the airport on the way in. Kodaly korond is the stop for Metro 1, walk up Sziv utca from Andrassy ut to Podmaniczky. Nyugati pu. is the stop for Metro 3. Walk down Terez krt and turn left at Podmaniczky. An inexpensive 3 day pass or even cheaper 7 day pass is purchasable at most stations for all City Transport. Metro 3 takes you to Kalvin ter (lots of tourist cafe's and restaurants) and the Central Market is situated near to this Square. The Metro's operate every few minutes. It is easy to cross the river to Buda either walking across bridges, 2 stops by tram, buses, or metro. 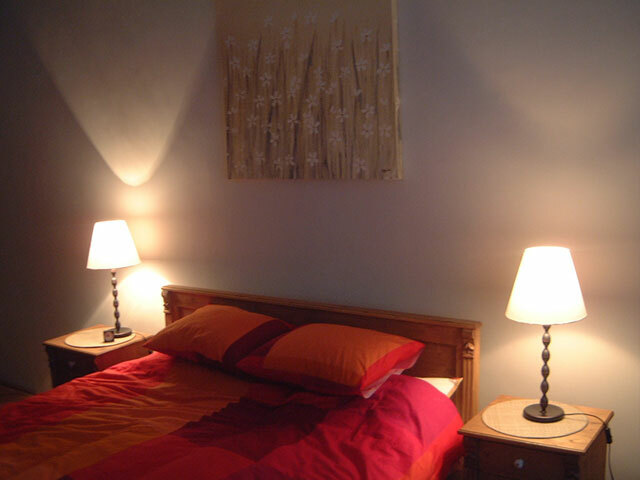 Many tourist attractions are within walking distance of the flat, walking down Andrassy ut a very pleasant experience. The River Danube close by with the surrounding hills and Margit Island another beautiful walk. Not far are the Parliament Buildings. Starting from the flat, 10 minutes walk to the Szechenyi hot baths in one direction, 10 minutes in the opposite takes you to the City Centre Shopping Mall with its smart shops and cinema, which also shows English films (including subtitles). Budapest is certainly a place where you can shop 'til u drop. The nearby Opera is well worth a visit, one of the most opulent in Europe. Many other Theatres, Ballet and Music Performances are also available. Budapest also boasts a large variety of Museums and Exhibitions, one of which is just round the corner from the flat and shows the history of Hungary from World War 2 to the 1956 Hungarian Uprising and beyond. "The place to be on a summer's day in Budapest." This apartment is on the 1st Floor of the building, and the building does have a lift (elevator).